The courtyard at Liberty Grand is one of our favourite places in Toronto to bring our clients out to take night photos on a wedding day. 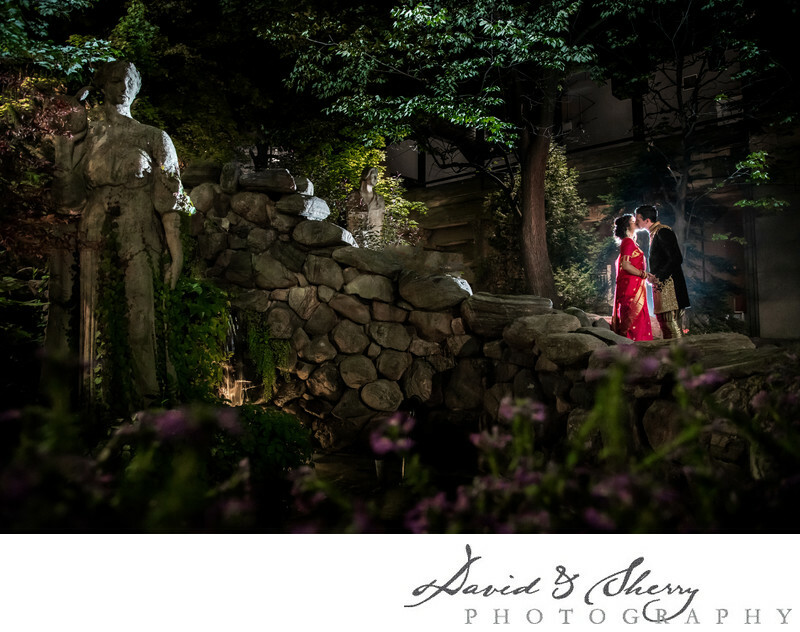 The architectural features including the fountain surrounded by rocks and statues and the trees planted throughout allows us a wide range of variety to choose from, then we add in our external flashes and speed lights to enhance the beauty of our bride and groom. In this Canadian/Sri Lankan cultural ceremony where the bride is wearing a sari and the groom has traditional Indian attire we applied a rim light to the couple kissing by the fountain after a retreat from the reception for just a few minutes. Liberty Grand is owned by Liberty Entertainment Group who have many of the high end luxury wedding venues around Toronto including Casa Loma and CIBO they are experts in hosting weddings. Though there can be several weddings a day in the Governor's Room, the Artifacts Room, Renaissance Room, Centennial Room and the Courtyard it feels like you are all by yourself because of the way they stagger the events so the ceremonies don't overlap. We have photographed tea ceremonies, getting ready, small receptions as well as large ones. 500+ guests are capable of celebrating with the newly married couple at this fantastic and historic venue with ample space with access to the waterfront to do large wedding party group shots as well as capturing the full decor of the stunningly designed reception.